The Ultimate Mini Adventure? 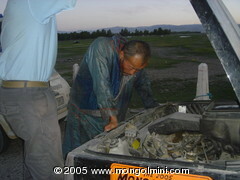 Take one 18 year old Mini and drive it 9000 miles via 5 mountain ranges and 3 deserts from London to Mongolia. So why did we do this? 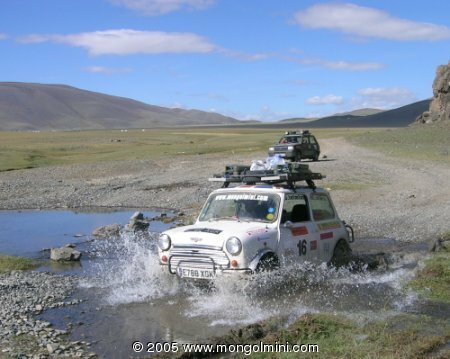 Well take a good look over this site to find out, but in short we fell in love with the idea of the Mongol Rally, "The Greatest Adventure in the World". We were one of only 14 cars of 41 starters to make the finish of the 2005 rally. 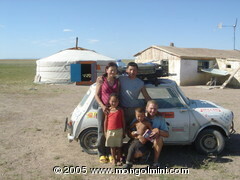 We covered almost 9000 miles, crossing eight time zones and thirteen countries, at the same time becoming the first people to ever drive a Mini from London to Mongolia. Take a look over our Picture Gallery and read our 'on the road' diary to get a feel of the adventure. Y para esos madrile�os que estais pensando, "reconozco ese mini... sol�a andar por Madrid" �no os equivocais... as� es!